Veda Vyasa:The happiness which comes from long practice, which leads to the end of suffering, which at first is like poison, but at last like nectar - this kind of happiness arises from the serenity of one's own mind. 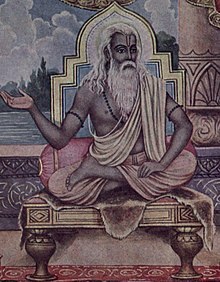 Veda Vyasa (Devanagari: व्यास, वेदव्यास veda-vyāsa), or simply Vyasa, is a central and revered figure in most Hindu traditions. He is also sometimes called Krishna Dvaipāyana (referring to his complexion and birthplace). He is the one who classified the Vedas into four parts). He is the author of the Mahabharata, as well as a character in it. 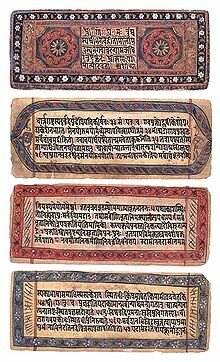 He is considered to be the scribe of both the Vedas and Puranas. According to Hindu beliefs, Vyasa is an incarnation of God Vishnu. Vyasa lived around 3rd millennium BCE. The festival of Guru Purnima is dedicated to him. It is also known as Vyasa Purnima for it is the day believed to be both his birthday and the day he divided the Vedas. Vyasa was grandfather to the Kauravas and Pandavas of the Mahabharata epic which he composed. 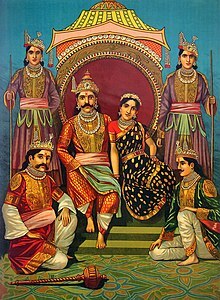 Their fathers, Dhritarashtra and Pandu, the sons of Vichitravirya by the royal family, were fathered by him. He had a third son, Vidura, by a serving maid Parishrami. Vyasa:literally one who spreads, also known as Veda Vyasa and Krishnadvaipayana, traditionally recognized as the author) as well as protagonist) of the Sanskrit Mahabharata, the Puranas, and Upansishads and the compiler of the Vedas. 18 chapters of Vyasa's Jaya constitutes the Bhagavad Gita, the sacred text of the Hindus. Thus, this work of Vyasa, called Jaya deals with diverse subjects like geography, history, warfare, religion and morality. Vyasa:Remember me when things are to be done. Vishnu Purana (Book 3, Ch 3), in The Vishńu Puráńa: A System of Hindu Mythology and Tradition, p. 219. Kumkum Roy, in Historical Dictionary of Ancient India, p 471. Sage Vyasa is known as Veda Vyasa, as he classified and compiled together, the vast body of Vedas or mantras then existing. He classified the Vedas in four, namely Rig, Yajur, Sama and Atharvana and taught them respectively to four great Rishis – Sumantu, Vaisampayana, Jaimini and Paila. Sage Vyasa also composed the 18 Puranas, which contain the purport of the Vedas and asked Suta, a sage revered for his knowledge and devotion, to teach them to the world. Kamakoti Organization, in "Vyasa and Vedic Religion". B. K. Pandey, in Encyclopaedia of Indian philosophers, Volume 2, p. 14. Dinkar Joshi. Glimpses of Indian Culture. Veda Vyas did not possess four faces, yet he was like Brahma. He did not have four hands yet he acted like Vishnu. He did not have third eye and yet he was like Shiva. “I bow to Vishnu embodied in Vyas and Vyas embodied in Vishnu. One who enriched India through his speech, I bow to thee O Veda Vyas, the poet and creator of destiny and the knower of all. Shri Krishna says in the Gita, “I am Vyas among Munis [sages].” Veda Vyas is the heart of our culture, the founder and spokesperson of Vedic dharma. Vyasa was endowed with divine energy. He was great yogi, unfathomable scholar, poet par excellence, accomplished philosopher, great preacher, mighty metaphysical as well as a revered singer and preacher of Krishna bhakthi. Vyasa was a personification of Vishnu and god incarnate. Alf Hiltebeitel. Rethinking the Mahabharata: A Reader's Guide to the Education of the Dharma King. Remember me when things are to be done. Vyasa to his mother Satyavati Kali, after he was born and forced his body to mature that very day by will power”, meaning that he would appear before her whenever she thought of him, quoted by Alf Hiltebeitel in P.47. Vyasa:He [ Dhritarashtra ] will be a man with strength of a myriad elephants, a great and royal rsi, of great fortune, great power, and great intelligence. And 100 powerful sons will be his, but because of his mother’s lack of virtue, he shall be born blind. Bruce M. Sullivan. Seer of the Fifth Veda: Kr̥ṣṇa Dvaipāyana Vyāsa in the Mahābhārata. In the religious traditions of the Hindus, the most important author of sacred texts is Krishna Dvaipayana Vyasa. He is traditionally credited with the arrangement of the Veda into four texts as well as the composition of the epic Mahbharata (Mbh), many Puranas, and other works. 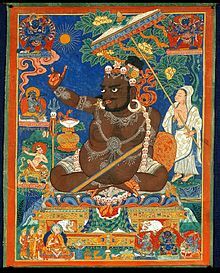 Vyasa, however, has been described as mythical as his existence is impossible to prove except in myths and legends such as are preserved in the epic. He will be a man with strength of a myriad elephants, a great and royal rsi, of great fortune, great power, and great intelligence. And 100 powerful sons will be his, but because of his mother’s lack of virtue, he shall be born blind. Vyasa’s curse to the first widowed wife of his half brother on the son to be born to them. His mother [Satyavati] had asked him to produce heirs to the throne with the two widows of his half-brother. The first princess closed her eyes as Vyasa was in fearful ascetic condition when he slept with her. In due time Dhritarshtra was born blind. Quoted in p. 58. Because you paled on seeing my ugliness, your son shall be pale (pandu), and that will be his name, O, woman with the beautiful face. 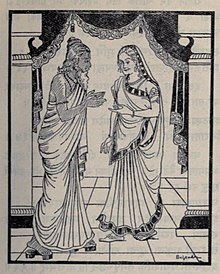 Vyasa’s curse to the second widowed wife of his half brother on the son to be born to them. The second widowed princess was frightened at the ugly sight of Vyasa during their union. Thus, Pandu, a pale looking son was born to them. Quoted in P.58. Vyasa is depicted as the spiritual preceptor of five Brahmins who learned from him the Vedas and the MBh, and whom he instructed in religion. He also gave spiritual counsel to members of the Bharat family, both Pandavas and Kauravas, exercising control over their lives. That he was their spiritual preceptor as well as their concerned elder is particularly evident in the case of Pandavas, in whose lives the major events were supervised by Vyasa. The comprehensive picture drawn here of Vyasa in the MBh includes his functions as seer, priest, ascetic, and spiritual preceptor. Of all the epic’s, Vyasa is the one who most closely corresponds to the idea of brahminhood promulgated by the dharma literature and the MBh’s Shanti Parvan- The section of the epic having the greater similarity to the dharma literature. Vyasa’s words had trasnsformatory power according to legend. A group of people in Bengal regard themselves as brahmins, because Vyasa once called them Brahmins; hence they are “Vyasokta” brahmins. The myth of their origin tells how Vyasa once hailed some people on the opposite bank of a river, mistaking them for brahmins in the early morning-mist. In fact, they were fishermen mending their nets rather than Brahmins doing their morning worship rites, but because he had greeted them as Brahmins and his words could not be false, his speech transformed them to Brahmins. Prof Ralph Nicholos, in p. 50. Vyasa’s activities in the MBh cover the full range of activities traditionally deemed appropriate for a brahmin. Unquestionably Vyasa is the epic’s foremost expert on the Veda and the ritual activity enjoined by the Veda. Having rearranged the one Veda into four texts, Vyasa taught those to his five pupils along with MBh as the fifth Veda. Because a long stay in the same place does not add to one’s own happiness and might disturb the serene ascetics; the deer are eaten up and the plants and herbs depleted. Vyasa's advise to the Pandavas, his grandsons who were staying in the forest. Quoted in p. 49. It has been said by Sanatkumara and the great-spirited Vyasa, and it is enjoined in the Veda, O, King that one should go to Pratudaka on pilgrimage. On the writing of MahabharataError on call to Template:cite web: Parameters url and title must be specifiedSwami Tejomayananada. .
Vyasa wrote the first 40,000 verses and this book was named Jaya. Afterwards other writers added more stories and it became known as Bharata. Later still more additions were made until the composition became the Mahabharata as we know it today....We believe that Veds Vyasa was one person and that he alone composed the entire Mahabharata consisting of 100,000 verses, it is the world’s largest epic in existence today and an encyclopedia of knowledge. Swami Tejomayananada, in p. 139. It is said that when Veda Vyasa conceived the Mahabharata in his mind he knew that it would be a very large work and that he would need a stenographer to take dictation....Lord Brahma appeared and told him to invoke Lord Ganesha, the god of knowledge, who would assist Vyasa in his work. I am ready, but only on one condition. Once I start writing, you should not stop dictating to me. Ganesha to Vyasa on the latter’s request to him to write down his narration of Mahabharata. Quoted in p. 139. All right, I also have a condition:that you should not write down anything without grasping the full significance of what I say. Vyasa's condition agreeing to the terms set by Ganesha. Quoted in p. 139. Ganesha asked Vyasa when a difficult verse was narrated which he could not easily understand. This gave time to Vyasa to think and to compose his next verses. Quoted in p. 139. The desire to possess, the thirst for and the hankering after pleasure or the means thereof, preceded by a remembrance of the pleasure in one has who has enjoyed it, is attachment. The repulsion, the anxiety, the wish for removal and the anger at pain and the means thereof, which stick in the mind in consequence of feeling of pain, in the case of him who has felt the pain, preceded by a remembrance of the pain, is aversion. In all living beings exists the self-benediction, ‘would that I were never to cease. May I live on’. And this self-benediction cannot exist in him who has not experienced the nature of death. And by this experience of a former life is inferred. This is the affliction of Love of Life, which flows by its own potency. The vehicle of actions begin to ripen into fruit when the afflictions exist; not when the afflictions have been rooted out. As the rice in the paddy has the power to grow only so long as the chaff remains attached thereto and their seed power is not burnt up, not when the chaff has been removed, so also does the vehicle of actions grow into ripeness, when the afflictions are attached to it, and when is seed-power not has not been burnt up by intellection; not when the afflictions have been removed. The pain which has passed away has been spent up by experience. It cannot, therefore, fall within the sphere of avoidable. And that which is present, is being experienced at the time of its existence; it cannot, therefore, be considered as the avoidable with reference to the future movement of time. Hence that pain alone which has not yet been experienced, troubles the Yogi who is sensitive as the eye-ball; it does not trouble any other knower. Hence that alone is avoidable pain. The knower is the Purusa (the conscious principle) who cognizes the reflection from the Will-to-know by conjunction. The knowable consists of all the characteristics present in the essence of the Will-to know. This, then the knowable behaves like a magnet. It is useful only when placed here. On account of its capacity of knowability, it becomes the possession of the lord, the Purusa, who is of the nature of power of knowing. It becomes the object of the act of enjoyment, in as much as although by nature independent, it becomes dependent on another, existing as it does for fulfilling the object of that other....The conjunction therewith is the cause, by giving that up is secured the complete remedy of pain, in as much as that is found to be the cause of removal the real thing, the cause of pain. Pain is removed on the removal of the cause of pain. In the removal of pain consists the establishment of the Purusa in its own nature. What then is the means of attaining the state of this removal of pain? Discriminative knowledge undisturbed is the means of removal. Indian Adept (siddha) -The gods, the Rishis and the Siddhas become visible to him who is given to study, and they do take part in his work. Cleanliness, Contentment, Purificatory Action, Study and the making of Ishvara, the motive of all actions, are observances. Of these Cleanliness is external when brought about by earth and water etc., and consists in the eating of pure things, etc. It is internal when it consists in the washing away of impurities of the mind. Contentment is the absence of desire to secure more of the necessities of life than one already processes. ...causing of injuries to others is of three descriptions, that which is done and that which is permitted to be done. Each again is three-fold. Prompted by desire of gain, as in the case of one who desires to obtain flesh and skin; prompted by anger as in the case of a man who has received some injury; done though ignorance of the real nature of an act, under the impression that the act proposed is a virtue. The gods, the Rishis and the Siddhas become visible to him who is given to study, and they do take part in his work. The faculty of trance (Samadhi) becomes perfect in him who dedicates all his powers to Ishvara. By this he knows all that he desires to know, just as it is in reality, in another place, in another body or at another time. Then his intellect knows everything as it is. The happiness which comes from long practice, which leads to the end of suffering, which at first is like poison, but at last like nectar - this kind of happiness arises from the serenity of one's own mind. It is in the best interest of a man to become a Karma-Yogi and work to the best of his abilities and without bothering about the results. कालो ऽस्मि लोकक्षयकृत्प्रवृद्धो..... ( I am Time, the great destroyer of the world ~Bhagavad Gita 11.32). Today I got this desire, and tomorrow I will get that one; all these riches are mine, and soon I will have even more. Already I have killed these enemies, and soon I will kill the rest. I am the lord, the enjoyer, successful, happy, and strong, noble, and rich, and famous. Who on earth is my equal? Guru Purnimma is also called Vyasa Purnimna. On this day Bhagavan Veda Vyasa was born to sage Parashara and a fisherwoman. On this day Bhagavan Vedavyasa is said to have commenced the great work Brahma Sutra. Hence this day is also dedicated to the study of Brahma Sutra. He represents the entire Guru Parampara and he is worshipped very well. Anonymous, in Awakening Indians to India, p. 167.